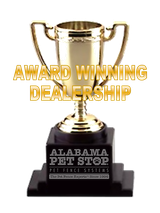 l Is Pet Stop of Alabama associated with Invisible Fence®, Petsafe®, Contain a Pet®, Innotek®, Dogwatch®, Dog Guard® or ANY other pet fence brand than Pet Stop®? No. We are an authorized Pet Stop® pet fence provider. Pet Stop Pet Fence Systems of Alabama services and sells compatible products for all other brands of pet containment dog fences only as an independent contractor. This includes all hidden fence product upgrades, exchanges, trade-ins and replacements. l How old or big must my pet be to be trained to the fence? First of all, your pet should be well adjusted to the home environment before you start training. We recommend that your pet be at least eight weeks old, but has no minimum or maximum size limitations. It is helpful if your dog is accustomed to the leash before beginning training. l Will the correction hurt my pet? The correction is safe, harmless and humane. It is just strong enough to startle the dog. The correction produces less energy than that produced by a static shock from carpeting. l How long will it take to train my dog to the fence? Most dogs are fully trained in about ten to fourteen days. Our gentle training protocol drastically reduces the duration and stress of dog fence training and is more humane and effective than competitors' methods. l When do the batteries need to be replaced in the receiver? This will vary depending on how often your dog tests the boundary. In most cases the battery will last from 4 to 5 months. However, we prefer to have our customers change the receiver collar batteries every 3 months to insure uninterrupted safe containment. We send a reminder every three months to help you remember, and your initial year's supply of batteries will already be in your possession before you have to change the first ones. As a backup plan, the Pet Stop collar’s low battery indicator light will alert you when the batteries are low so you can change them before they expire. l Why are you a better choice than other local competitors? Since we founded our dealership in 1994, it has been continuously owned and managed by Keith and Rob McDonald. With at least a 10 year advantage in dog fence experience over any local competitor, we have been rated among the top pet containment dealerships nationwide over a decade. Only Pet Stop of Alabama’s trainers are certified to offer low-stress GentleSteps™ Training Protocol, and only Pet Stop Pet Fence equipment is designed to support it. Our thorough hands-on training, combined with Pet Stop’s highly customizable systems, has resulted in our 100% successful containment rating - the best in the industry. No local competitor can offer the extensive range of pet service solutions we do, or even come close to the level of industry competence offered by Pet Stop of Alabama. That’s why we are the only local pet fence company offering the SafeYard™ Containment Guarantee, with no time limit on guaranteed containment. l How is Pet Stop different from Invisible Fence® and other companies? Founded in 1992, Pet Stop is managed by a team of industry pioneers with the most experience and highest pet aptitude in the business. Only Pet Stop combines our genuine love of pets with in-depth knowledge and commitment to technology to produce the finest, most reliable pet containment dog fence in the world. By engineering and building their own products here in the USA, Pet Stop is truly unique. Every other pet containment “manufacturer” actually has their products made by other companies – and most do that in China. No other system can match the range of patented, customizable features offered by Pet Stop. Competitor systems are notorious for blind spots and holes, but only Pet Stop’s Tri-Scann Omni-directional Antenna offers a full 360° of protection for your pet, ensuring they remain safe in your yard. l Are your products compatible with other systems? Yes. Pet Stop is compatible with many other pet containment systems available on the market today, including some products made by Invisible Fence®, Dog Guard®, Dogwatch®, and Petsafe®. l Do you offer indoor systems? Yes, we do. Our indoor system is every bit as effective as our outdoor electronic fence system, but operates on a slightly different principle. The indoor unit is designed to customize areas of the home for your dog or cat to avoid, rather than keep contained within; however, the system can be used to limit a pet’s habitat if need be, either with wire or without. l How do your warranty policies work? When you buy a Pet Stop system, we’re confident you’re purchasing the best electric dog fence on the market, hands-down. This belief in the effectiveness of our products makes it possible for us to offer a lifetime warranty on most products, as well as the following simple offer: if you can find a more advanced pet fence system than Pet Stop, we’ll buy it for you. Period. l Can I take my system with me if I move? Absolutely. All you’ll need is wire installation to fence in the boundaries at your new location. 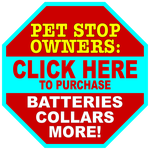 There are nearly 200 Pet Stop dealers in the USA & Canada, covering most areas nationwide. Contact us for more information. l Can I use an underground dog fence for my aggressive dog? No. We will not sell or install an electric dog fence for a dog with a history of aggressive behavior. The only exception is when our product supports a pre-existing wooden or chain link fence. Use of electronic corrections with known aggressive dogs is not recommended; instead, we suggest you call a quality professional dog trainer for their recommendations. l How much does Pet Stop cost? We offer several equipment and installation packages designed to fit most budgets. Your cost will depend the equipment package you choose, the size of your yard, the number of pets, and variables affecting installation. At Pet Stop of Alabama, we employ a policy of “Price Integrity”: Our equipment package prices are printed on our price quotes – no filling in blank spaces with whatever we want. We promise your price will be calculated in the same way no matter what your ZIP code.